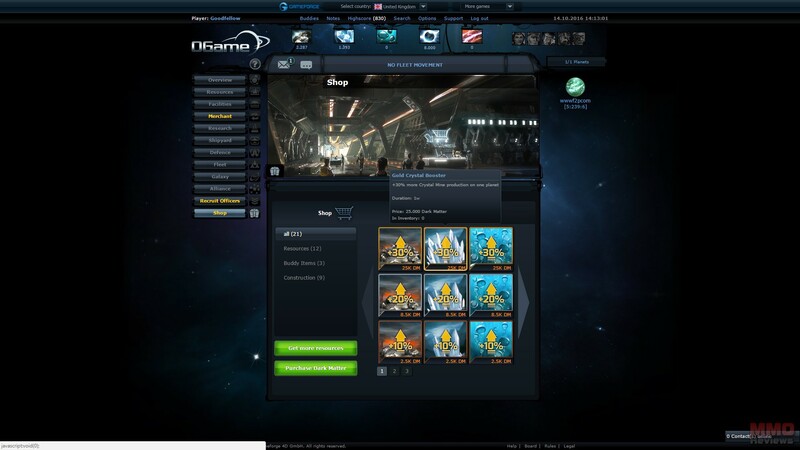 A space based free to play browser game OGame is an empire building strategy set among the stars, players must utilize their skills to build up an economically efficient planet and look to expand their territory laying claim to new worlds. Facing off against other players in rival raids, or working alongside them as trade partners or creating Alliances, the game offers a lot of tactical gameplay and is easily accessible through browser meaning it can be played on the go. As a web browser game OGame is more text based with accompanying visual images that are used to portray the them and tones of the game, the game lacks flashy graphics, action combat, or a cinematic experience, but instead provides the core strategy of an empire management game. Managing time, resources and pouring over various pages of stats and figures gives players a tactical framework to begin managing their planets, building up a fleet and working towards being a dominant force in the game playing competitively against other players. When starting out players get a list of Universes that they can start on, allowing friends to ensure they are on the same server as each other, but also each server can provide different options based off how old the server is (meaning existing veteran players who are already extremely powerful) to new servers where the players empires are still growing. Special event servers are available that offer different mechanics such as speed boosts where construction, resource gathering, movement and more are done at a quicker pace. The players home planet is their initial base of operation where they must craft their first mines to start getting access to their initial resources, research their first technologies to determine the direction they wish to advance for their own strategy, and ultimately start building up their initial fleet to defend their planet or raid nearby rival player or aggressive AI worlds to gain more resources. When players can afford to sink the time and extensive amount of resources required then they can finally build a Colony Ship, the first step into settling your next planet and the beginnings of your own Empire. With multiple planets players are able to exchange resources and military units between them, managing both areas and also having to focus on fielding a fleet large enough to protect both areas. Whether creating buildings on your planet to increase production, efficiency and open up new features, or building new ships for your fleet, players will have to acquire the necessary technology to construct certain buildings and units and have the resources necessary to do so. Construction can take minutes, hours and days depending on the type of building/unit or subsequent upgrade that each one can have; all buildings run on Energy and the more upgrades a building has the more Energy (maintenance cost) it building will require. Whilst combat isn’t action packed players will still see it evolve in real time, watching as their fleets sail to their location and engage in combat with enemy forces, having a full report of their victories and losses, and ultimately the outcome of the battle. Similarly being aware of an incoming attack can take hours or days, depending on how far the enemy is traveling, giving a player time to reinforce their defenses, rally more ships, and even call upon their Allies for support if needed. Combat essentially is a rock-paper-scissors scenario where certain units are stronger than some, but weaker than others, and the various techs, upgrades, number of each unit type and other elements all factor into whether a player will see victory or defeat. The first half of this vid is from Eve Online. The BEST MMo.